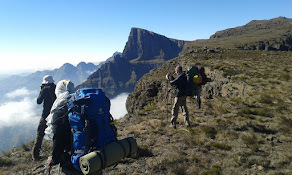 Guided Hiking, Trekking and Climbing Adventure tours in South Africa's Garden Route and Drakensberg. GoVertical Mountaineering guides offer an action packed five days in the Drakensberg or Cape Fold Mountains. This is an opportunity to break away from the daily grind, a personal growth experience in the vastly different environment of South Africa’s great mountain ranges, learn practical mountaineering skills while immersing yourself in the beauty of the wilderness. Camp Craft, - how to choose a great site, make a safe and efficient camp and of course prepare GOOD food. GoVertical Mountaineering Adventures. Simple theme. Powered by Blogger.